A little less than a year ago I randomly met a guy who lived in my building who would later turn out to be a multimillionaire. 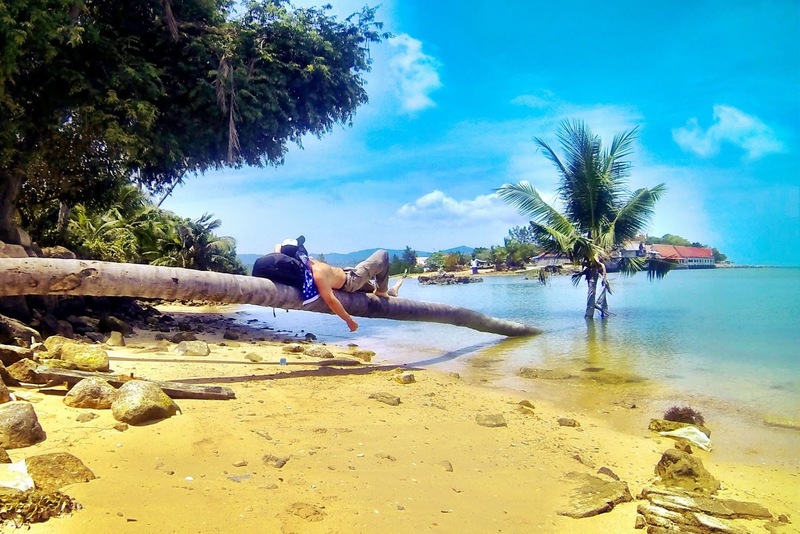 At first, I just assumed he was just another digital nomad, another millennial who lives and travels in places like Chiang Mai, Thailand where we first met. A few years ago, digital nomads were known as bootstrapping on a budget freelancers. But things have changed. 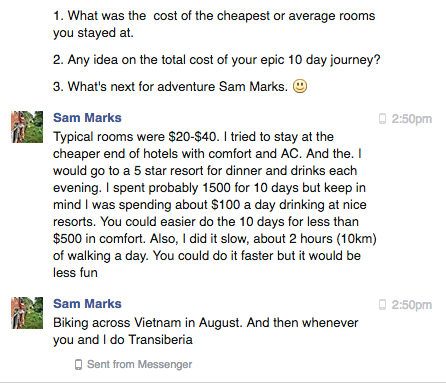 And guys who Sam Marks who recently sold his company for $100 million dollars shows us what life is like when you're young, rich and have the freedom of time and money to travel. 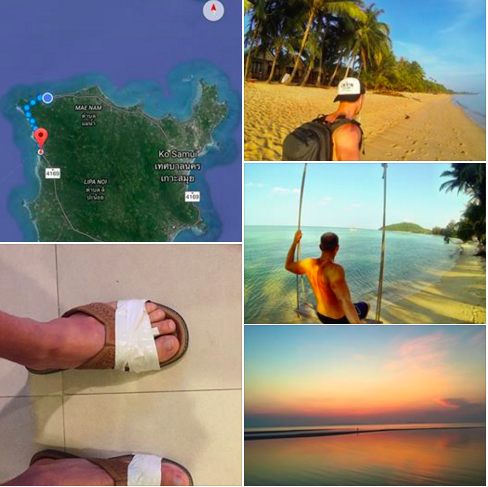 My only regret is not taking him up on his offer to walk around the island of Koh Samui, which honestly at first sounded pointless and boring, but turned out to to be an epic event! What do you do when you have freetime, money, and seek adventure? You embark on random journeys that most people with jobs or responsibilities can only dream of. 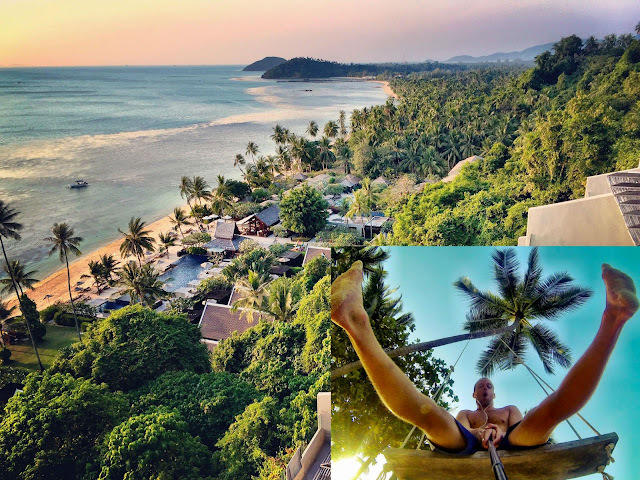 While the rest of us digital nomads sit in coworking spaces, guys like Sam tease us with adventure and photos that make us either want to hit that like button or unfriend him entirely! I can't even imagine what it's like for people still sitting in a cubicle back home! If you're curious how Sam made all of his money, here's his full talk from the 2016 Nomad Summit where he shared publically for the first time ever his journey of building the business. Walking around Koh Samui: Lamai to Chaweng, 10.2km. During day 1 of this historic journey, I was bitten by a creature that left a welt, probably a mosquito but who can be sure in these far out lands. Later I stepped on a shell that nearly broke the skin. Walking around Koh Samui: Chaweng to Bophut 10.8km. A day that proved even more challenging than the first. The ocean breeze was gusting a fierce 5 knots, and the sun so sharp it was caused a reflection on my GPS making it difficult to read. Then I was approach by a local inhabitant who offered to sell a fresh coconut for 20 THB (0.6 USD). I relented and purchased it, then drank it under the shade of a palm tree as I calmed down. Amidst concerns of further intimidating encounters with locals, I stay the course and forge ahead. 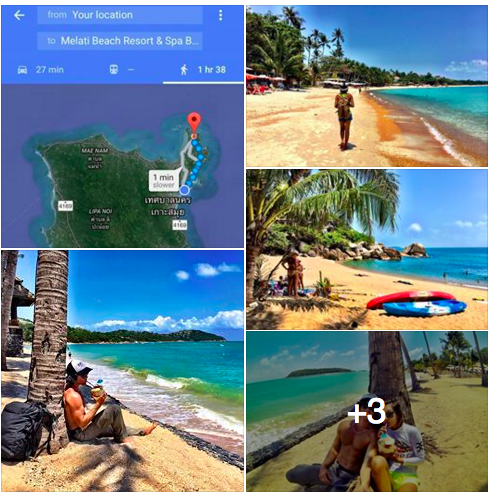 Walking around Samui: Bophut to Bophut Beach, 12.65km. Today the sun was so sharp I had to switch from SPF 20 to SPF 30 sunscreen. This would be enough for a lesser man to succumb and call the journey off, but I press ahead into the uncharted, and force a smile knowing my ambitions far outreach my talent. Walking around Samui: Bophut Beach to Bang Po, 12.65km. Today, the blister on my lip has grown unbearable… is it from the scorching sun, or just an inflamed cold sore? Contemplating this now is erroneous because the chance for infection in this wasteland is very dear. “we do this not because it is easy, but because it is hard”. Walking around Samui: Bang Po to Lipa Noi, 8.9km. A major malfunction in my equipment has put the completion of my record setting journey in jeopardy and delayed my progress. But like any pioneering man, pushing human endurance and physics to the limits, I too travel with masking tape. A low weight modification to my Tommy Bahama sandals has put me back on course, proving at least for the moment, that my 24 consecutive year membership to Boy Scouts of America has paid off. Walking around Samui: 70km deep, to late to turn back. Already there has been blood, sweat, and now many many tears as I am overwhelmed by the enormity of the endeavour. A new tide of luck seems to be drifting my way. As I staggered along the beach, a local caretaker approached me from a clinic called Nikki Beach. After seeing my impoverished and desperate state, they placed me in their facilities to rest my battered body and treated me with cold concoctions of hallucinogens and intoxicants, as locals from a nearby village perform a tribal dance to commemorate our new found bond. Walking around Samui, 11.2 km. 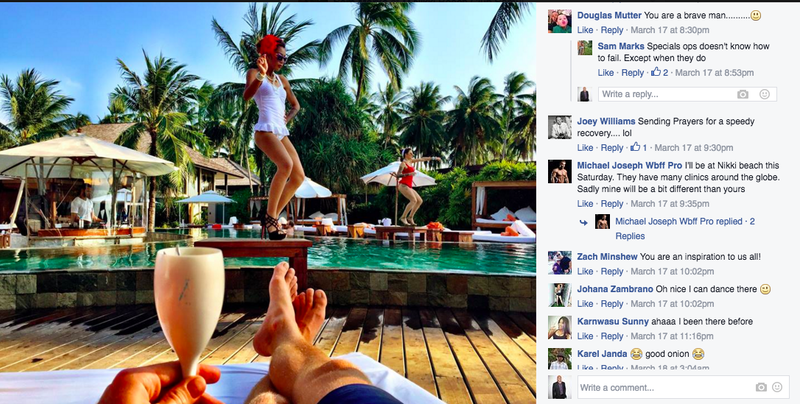 All good things come to an end, but in Samui do good things ever begin? I am starting to wonder. Yet, the pressure continues to mount. An anonymous donor by the name of Kevin SHee has pledged $1000 to charity if I can finish the feat in less than 10 days. I can’t let the kids down. But 10 days? a record time that would likely stand for the next millennia. The locals here hurry to gather as they see me stagger along. “Why, take on the mighty Samui”? “Wǒ cóng wèi yǒuguò de xuǎnzé"
Which of course in Chinese means, “I never had a choice”. Walking around Samui, 13.25 km. Before starting this challenge, I watched all 7 seasons of Man vs. Wild and attempted a 2 day low carb diet, both were instrumental in helping me prepare for the hardships I would encounter. Here you can see I had made high lodge up in a tree, far away from predators below. As I lay here I ponder, why has Bear Grylls never attempted to take on Samui? For lacking the necessary skills? Probable. Just plain scared? More likely. And who could blame him, after all in Thai “Samui” means “flowering buffalo” which doesn’t exist, and thereby perpetuates fear of the unknown. 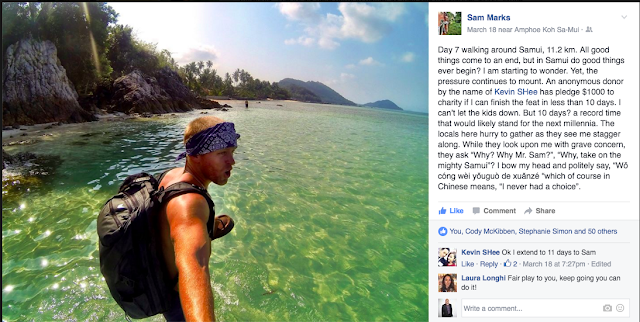 Day 9, Man vs. Samui, 11.2 km. The finish line is now in reach, just a days march away. I awoke early this morning, before the sun rose to beat the tremendous heat, but to my horror what did I find? The unmistakable crow of roosters. I first encounters these prehistoric alligator birds in the jungles of Guatemala where they had evolved to have metal blades on their feet and were fighting MMA. Is the Samui rooster as savage as its Guatemalan cousin? A shan’t be finding out with any luck. I wont be doing any further bush walking today, better to press to the coasts, knowing that they can’t swim with their large, heavy metallic feet. Back to where it all began. The mighty Samui officially conquered by man. I now have 2 world titles under my belt. 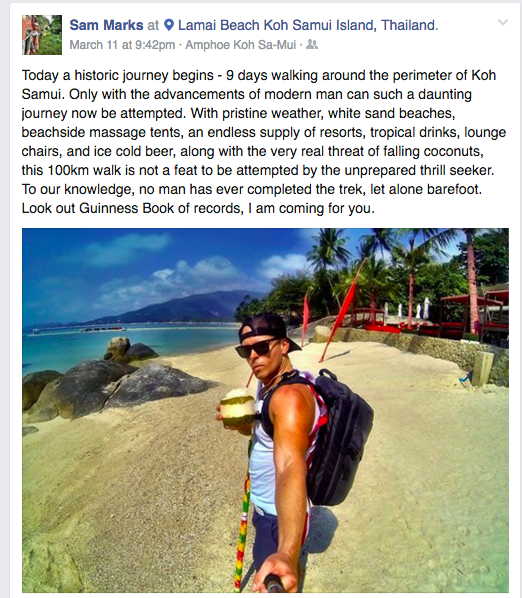 The only human to ever circumnavigate Koh Samui by way of beach, either barefoot or in sandals. And coincidentally I also own the speed record of 9 days, 2 hours, and 42 minutes. I hope my parents are proud. And all joking aside, special thanks to my good friend Kevin SHee for donating $1000 to charity. Later this year we will be donating and building a playground for an Orphanage in Cambodia. Even though Sam obviously wrote about his journey in satire, there's still a lot we can learn from his journey. 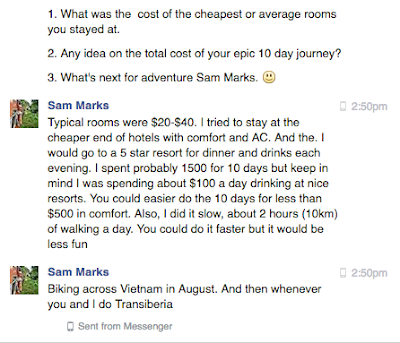 Adventure never has to stop and a lot of things that millionaires do don't actually cost that much money. 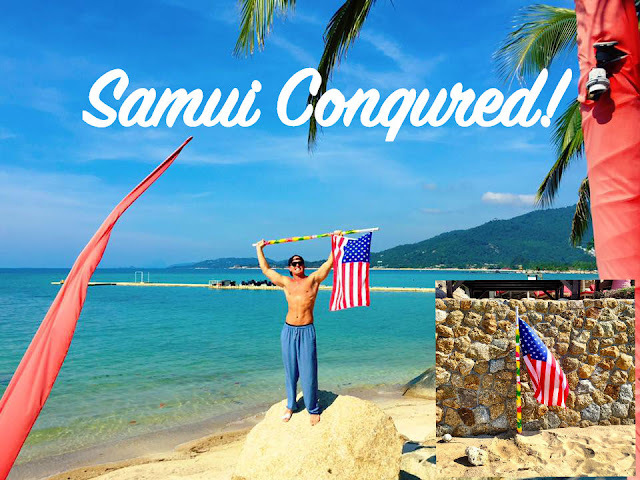 Aside from the night splash out at a high end resort for dinner and drinks Sam stayed at standard hotel rooms and ate cheap Thai food and sipped on coconuts for lunch. 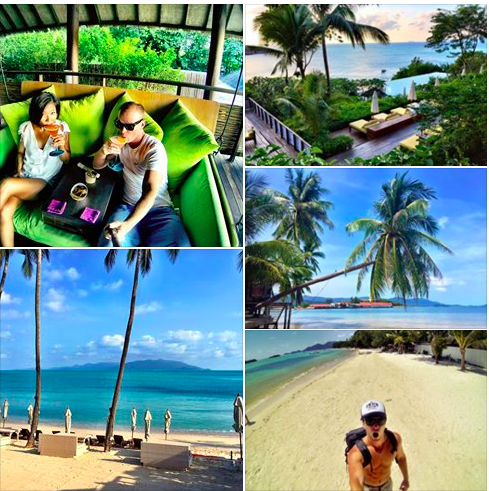 This just shows how obtainable an epic 10 day vacation on beautiful islands like Koh Samui, Thailand can be. 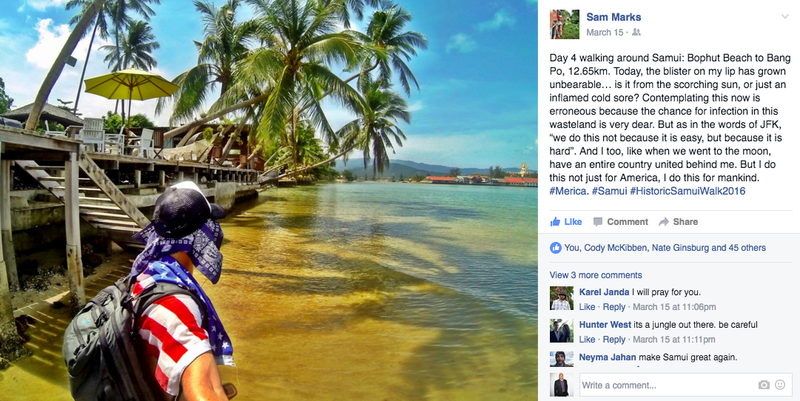 I won't' be surprised if I start seeing other people follow in Sam's footsteps to make the same pilgrimage, and you should! 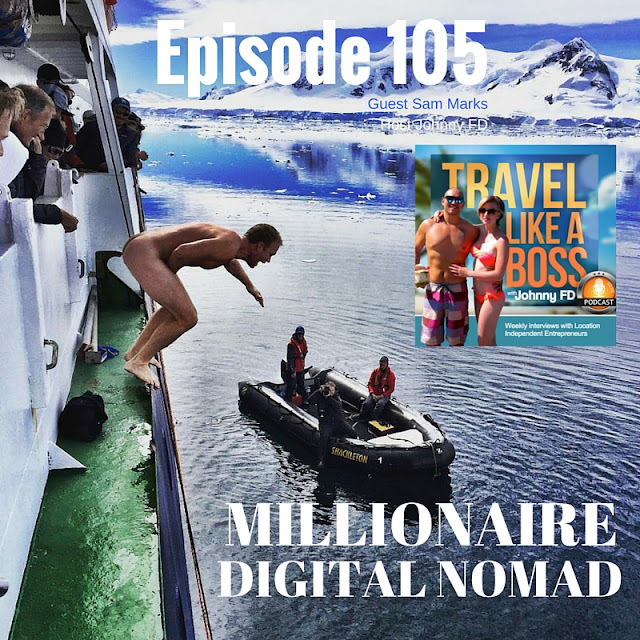 Listen to the interview I did with Sam Mark's on the Travel Like a Boss Podcast Episode 105 where he talks about his recent trip to the Antarctic and why he decided to jump naked into the ice cold waters. He also talks about his mindset about making and spending money and discloses why he often flies coach or stays in hostels instead of 5 star resorts. You can listen to the entire episode here for free or if you prefer to listen to it later, subscribe to the Travel Like a Boss Podcast on your phone's podcast app and look for episode 105. Watch Sam Mark's full talk at the 2016 Nomad Summit where he publicly reveals for the first time the secrets behind how he helped start a company that later sold for $100,000,000. You can watch all of the talks of the Nomad Summit for free by signing up for the mailing list at NomadSummit.com and get notified when tickets become avaliable next year. This year's Nomad Summit was held again in Chiang Mai, Thailand where over 200 digital nomads from around the world gathered for an epic day of sharing, learning and meeting fellow location independent entrepreneurs. 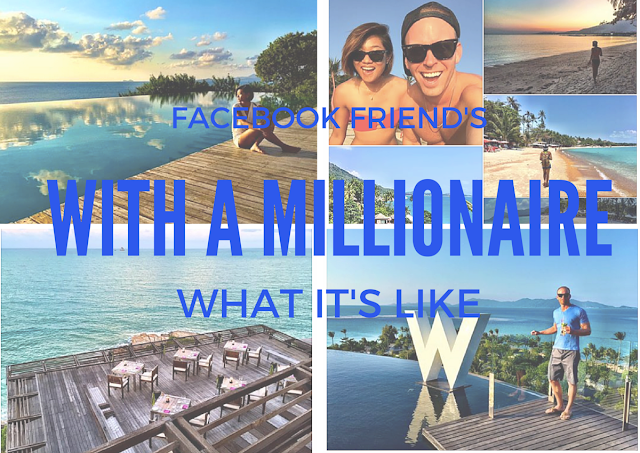 If you enjoyed this post, please share it! I'd love to see this epicness start a movement! I have a beginner question. Creating website is done before calling the suppliers or manufacturters. If this right, what products do I put on website? Even if they are dummy products of that manufacturer, would the suppliers buy that. or do they look for a full functional website to make sure we are legit? Hey Quinton, really glad you enjoyed the post and the video! We actually haven't even released this one yet at NomadSummit.com but I throught it would wrap up this post perfectly so I made it unlisted and embeded it here. Make sure you share this post! I'd love to see it spread! Damn that had to be one of the most inspiring blogs and video i have read and seen all year. Thanks Johnny FD. Really glad you enjoyed it Dario! 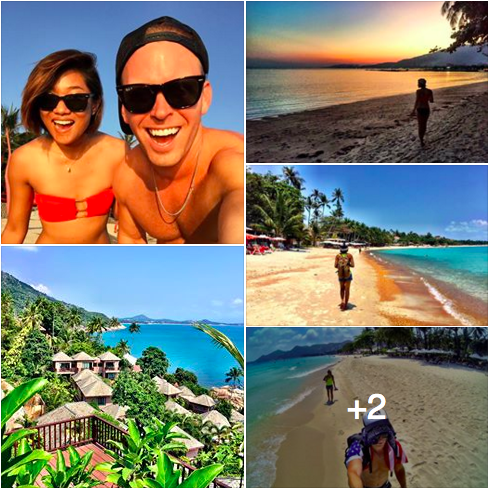 One of my goals for 2016 is to share the journeys of other successful digital nomads and not just my own! Do me a favor and share this story! I'd love to see it spread!